If there’s one essential tool for dental health, it’s the toothbrush. But though simple in basic design, manufacturers have nonetheless created a dizzying array of choices that often muddy the decision waters for consumers. It doesn’t need to be that way—you can choose the right toothbrush like a boss. First, though, you need to know a toothbrush’s purpose expressed as two basic tasks: removing dental plaque, the thin biofilm that causes most dental disease; and stimulating the gums to maintain good health. So what should you look for in a toothbrush to effectively perform these tasks? Here are 3 important factors to consider when buying this essential dental care tool. Bristle quality. First, it’s a myth that bristles should be hard and stiff to be effective—in fact harder bristles can damage the gums. Opt instead for “soft” bristles that are also rounded on the ends. And look for bristling with different levels of length—shorter length sections work better around the gum line; longer sections help clean back teeth more effectively. A “Just right” size. Toothbrushes aren’t uniform—you’ll need to choose a size and shape that works well for you personally. You might find an angled neck or a tapered head easier for getting into your mouth’s hard to reach places. If you have problems with dexterity, look for a brush with large handles. And be sure to ask us at the dental office for recommendations on brush dimensions that are right for you. ADA Seal of Acceptance. 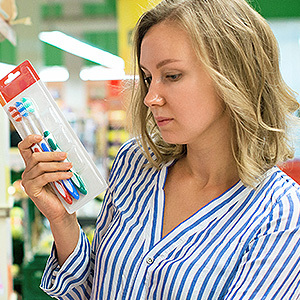 Just like toothpaste brands, the American Dental Association assigns its seal of approval to toothbrushes they’ve evaluated and found to meet certain standards. Although you can find high quality toothbrushes that haven’t sought this evaluation, an ADA seal means it’s been independently tested and found safe and effective for use. Of course, no matter how high quality the toothbrush you buy, it’ll only be as effective as your brushing technique. So, be sure to use gentle circular or oval motions along all your teeth and gumline surfaces—it should take you about two minutes. We’ll be happy to show you the proper technique in more detail, so you’ll be able to get the most out of your chosen toothbrush. If you would like more information on effective daily hygiene practices, please contact us or schedule an appointment for a consultation.